If our favorite Barbara doll had married a David, a Thinker or any other cast-in-stone fellow, she may have used these arts & crafts molds for her household wares. 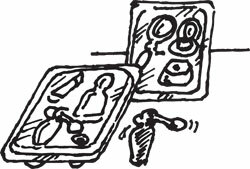 Our set includes (4) different 4-1/2" square molds with (4) different shapes each for a total of (16) shapes--and you'll get two full sets. That's a total of (32) molds, in case you don't have a calculator handy. Includes a make-up mirror, hair curler, diamond ring, lipstick and perfume bottle. 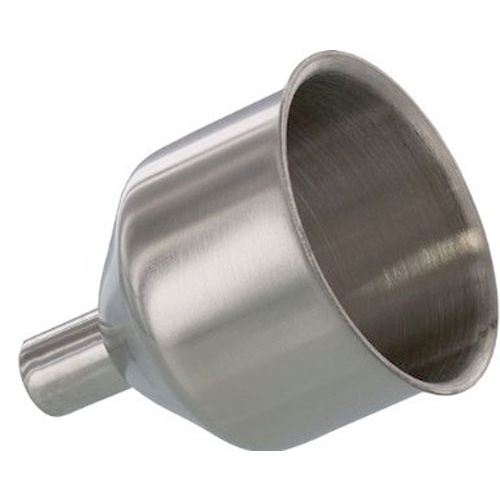 Four fine funnels, a fantastic fare. 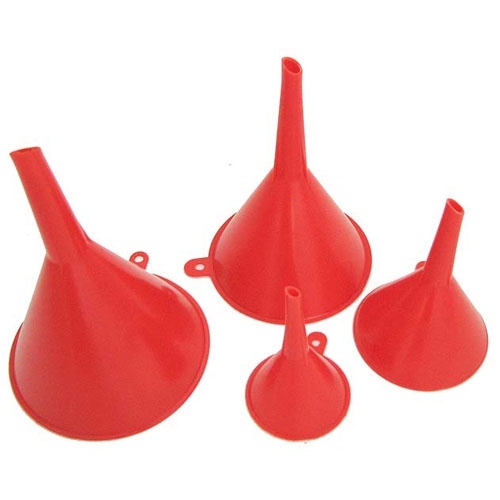 Sturdy plastic, the biggest is 4-1/8" dia at the mouth, with a 1/2" dia spout, the smallest has a 1-7/8" dia mouth, 1/4" spout. The other (2) are in between. Frankly, it's freaky fun flowing fluids from four funnels! Let's cut to the chase here -- buy these the first time you read this, or they're going to be gone! 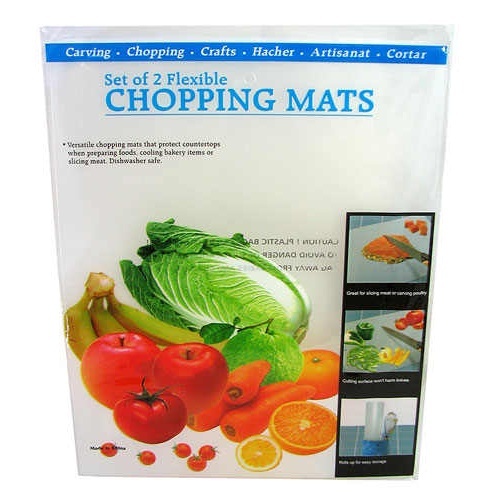 There aren't that many of these flexible chopping mats, and the versatile 15" x 12" x 0.024" thick mats are not only ideal for small kitchens where every inch counts, they're great for any kitchen, and for cookouts, camping and picnics. 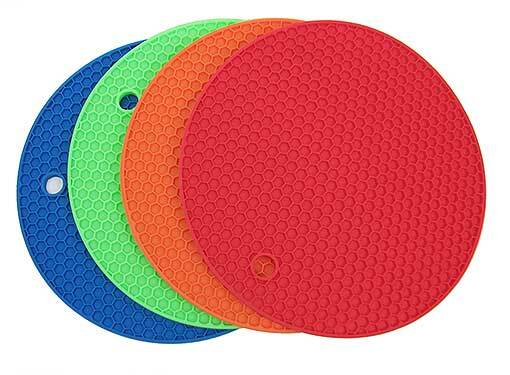 Our each is a set of (2) of the translucent Euro-look mats that protect countertops from sharp knives and fresh-from-the-oven cookies, and protect food from outdoor surfaces. They can be lifted and slightly folded to funnel chopped food neatly into a pot. 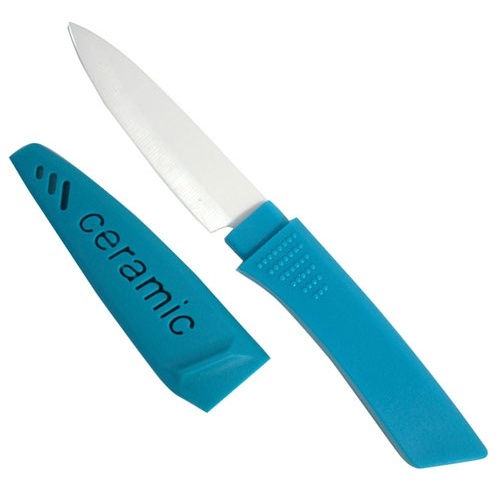 They're dishwasher safe, and roll up for portage or storage. 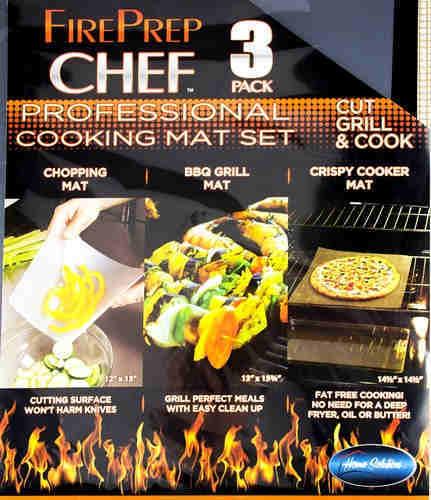 Mats-R-Us, and we’ll prove it with this 3-piece set of flexible cooking mats, including a 15" x 12" white plastic, flexible chopping mat; a 13" x 15-1/2" black plastic (PTFE) grill mat to keep smaller items from falling onto the coals; and our fave, a 14-1/2" square crispy cooker that prevents frozen pizza soggification, among other things. Konvenient for kamping! And kramped kitchen kabinets! 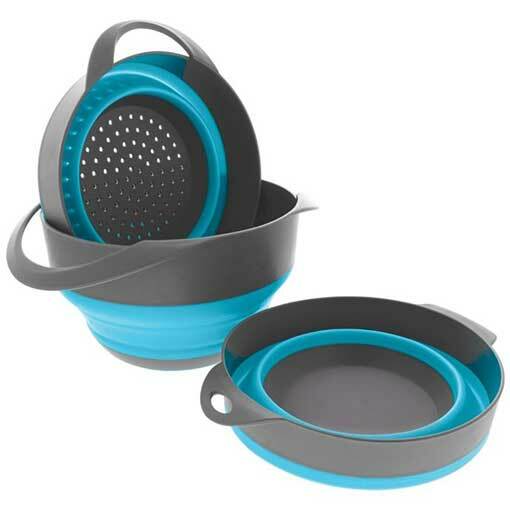 These nesting, collapsible silicone and plastic bowls are made for campers but they work great at home, too, particularly for apartment-dwellers, whose space is precious. In gray and powder blue. You’ll get an 8” dia x 5” deep bowl, a 7” dia x 3-3/4” deep bowl, and a 7-1/2” x 4-1/2” deep colander. Smoosh them down and they turn into one 11” wide (counting handles) x 2-1/2” deep nest. Pay no attention to the temperature misprint on the package; these bowls are good for up to 160 degrees Fahrenheit. 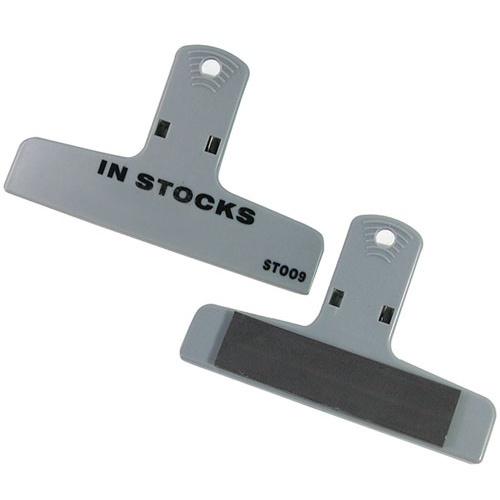 This 4" wide plastic bulldog clip has serrated jaws to hang on tight, and a light fridge-strength magnet on the back. We’ll pick five (5) from our selection of gray, light blue or bluish-greenish-blue clips adorned with assorted misprints. You can ignore the words. You can also ignore the magnet and just use them to reseal your nacho chips, which makes them chip clips. If the Tin Man had been plastic, this would have been his lid, and he'd have been rust-free. 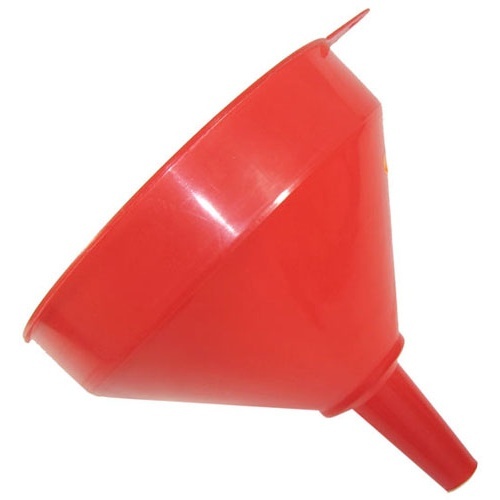 Our giant plastic funnel is 9-3/4" dia with a 3-1/8" long x 15/16" ID neck. Just under 10" tall top to bottom. Could be red or green depending on which way the surplus wind blows. Hang it by the little tab with a hole on the top edge. Buy (3), get a tennis ball, and run the biggest shell game in town. 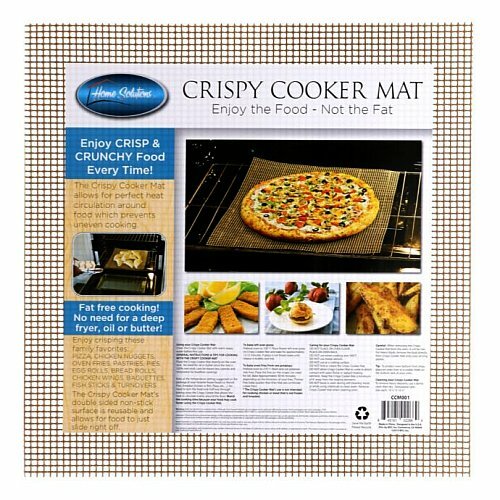 Call it the fat-free oven mat. It's a 14-5/8" square grid, with 3/16" mesh, coated with PTFE (polytetrafluorethylene), a standard non-stick surface whose name you'd recognize. The manufacturer, Home Solutions®, recommends it for pizza, chicken nuggets, oven fries, rolls, baguettes, fish sticks and anything else you want to cook crispy on an oven rack.